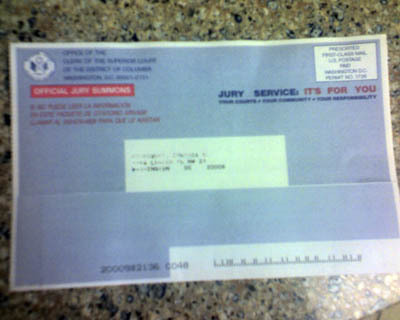 "Jury Service: It's For You"? Man, that's just mean. I can almost hear the summons people laughing as they print those things. But then, considering what their existence must be like, if I were them I might look forward to ruining other people's days, too. Hey, if you're lucky, maybe you'll get sequestered! Then it's like camp, just without all the outdoorsy fun. And s'mores. But you do get indoor plumbing at least. So there's an upside. By the way, re: entre nous - am I the only one who can't hear that phrase without having Bueller flashbacks? Just checking. I -- ME --don't really say entre nous!! OMG. It was a little joke. I was making fun of somebody ELSE. I swear. Thank God for anonymity.